Welcome to the St. Patrick Catholic High School Alumni page! Founded in 2016, our Association supports the school’s mission of faith, learning, and service by facilitating more meaningful lifelong relationships within the global St. Patrick family — alumni, parents, and fans. Click the link below to update your information to stay connected with the Fighting Irish community, including class reunions, athletic events, and volunteer opportunities. After updating your information, click the link to join the Alumni Association and become a member. The Alumni Association strives to ensure that alumni of St. Patrick Catholic High School and its four legacy schools have ample opportunities to engage with their respective alma mater. 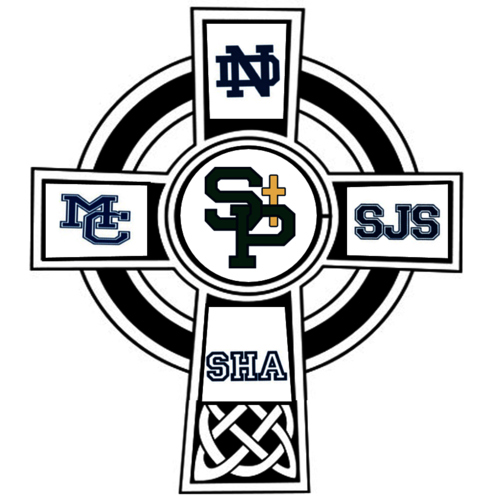 Our Alumni Association is inclusive of graduates from St. Patrick Catholic High School, St. John High School, Mercy Cross High School, Sacred Heart High School and Notre Dame High School. Our alumni are a driving force in the effort to advance St. Patrick Catholic High School. By joining with those who support the Alumni Association, you will be helping the Association act on behalf of all alumni to support and maintain the greatness of our school and the tradition of Catholic education. As a member of the Alumni Association, you are not just giving back, you are also laying a solid foundation for a stronger school for generations to come. Our Alumni Association serves as your voice and your connection to your alma mater. When visiting the area, be sure to stop by and say hello – you’re always welcome! Subscribe to our monthly e-newsletter by clicking the button below. If you’re interested in joining the Association, please click the button below to purchase your membership. Memberships last from September 1 until August 31 annually.